There are 78 different places to pick your own apples in Massachusetts. Regardless of your thoughts on apple picking – love it, hate it, would never spend $17 to stomp through a muddy field – if you do venture out, you’ll be taking home a big sack of apples. There’s only so much pie you can eat, so if you want a (slightly) healthier, quicker, and easier way to get rid of all of those Jonagolds, try this. Core apples, then peel one strip of skin from the middle of each. Place in a small baking dish lined with foil. 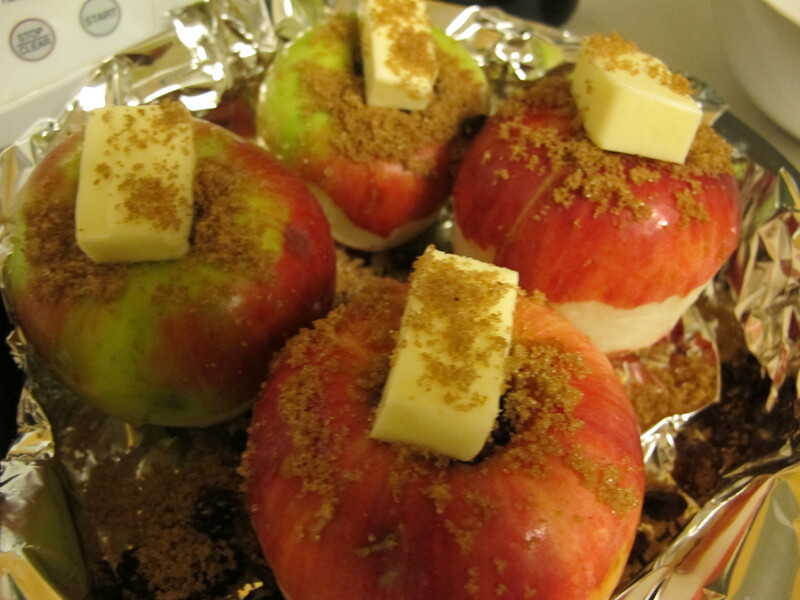 Mix up spices, brown sugar, and raisins, stuff mixture into the middle of each apple. Top each with 1/2 tbsp of butter. Pour apple cider in the bottom of the pan. Bake at 350 for 30 minutes, basting apples one or twice during baking. Voila.